We got a chance to look at the Sanyo eneloop hybrid bicycle at the Interbike show this year, but now the company’s officially unveiled the bike at the Consumer Electronics Show in Las Vegas. Thanks to its earth-friendly bicycle-slash-electric bike design the eneloop nabbed the top priTemplates and Themes for the Eco-Design and Sustainable Technology category. 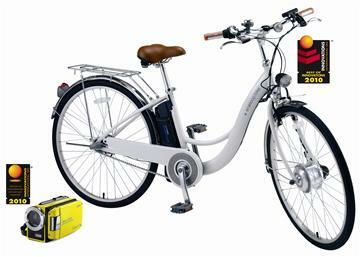 The three-speed eneloop uses “regenerative” technology (much like hybrid cars do) in order to charge the battery from the pedaling. The motorized front hub provides three assist modes to help provide a boost when a rider can’t keep up with the terrain. Cycleicious has an early hands-on review of the bike which appeared in Momentum #43.